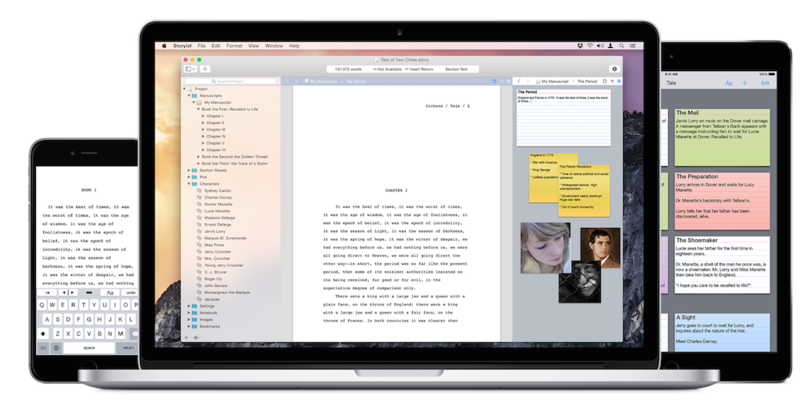 Storyist 3.1 – Story development tool for novelists. A word processor with a page layout view and support for headers, footers, and style sheets. A storyboard with customizable story sheets for tracking your plot, characters, and settings. A project manager with fast, project-wide search capabilities to keep your writing organized and accessible. Storyist now supports dark mode on Yosemite. To enable dark mode, open the Appearance pane of the Preferences window, select Interface (the 4th tab) and click the dark mode checkbox. Storyist can now print storyboard items (e.g. index cards) and outlines. When printing, Storyist now correctly accommodates the non-printable area reported by specific printers. Previously, Storyist would incorrectly shift the margins to the left by the non-printable left margin amount. Storyist no longer crashes in certain circumstances related to editing the status bar, opening multiple windows, and changing stylesheets on a manuscript without headers/footers. Snippets are now sorted properly when you click on the header in the snippet preferences table. Software update now defaults to checking daily. The Format > Text > Spacing command, which did nothing in version 3, has been removed. The Storyist name again appears next to the Storyist icon in the Force Quit dialog. The name wasn't displaying properly in 3.0.4. When saving projects, Storyist now compresses them in the background. This should eliminate the spinning beach ball that could occur during autosaves of a project with lots of large images. Storyist now handles the initial layout of large files more gracefully. If laying out your file would cause a significant delay before something is displayed, Storyist now presents a spinning progress meter until the layout results are ready. Storyist now properly restores the text selection/scroll position for large files when launching. Previously, the scroll position would be set at an earlier position in the file in certain circumstances (depending on the speed of your Mac). Fixed a bug on Yosemite that could cause the "Open a Copy" button in the Versions window to instead revert to the selected version. When importing Scrivener scripts, Storyist now applies the default screenplay stylesheet and removes the "<$ScrKeepWithNext>" layout directives that Scrivener embeds in its RTF. Scrivener files containing incorrect comment location information are now imported more reliably. This should fix some the issues people had when opening Scrivener files. When changing a theme's page background color, Storyist now ensures that the page background color is updated under the page shadow in the text editor. The Getting Started Guide no longer becomes unavailable after the first use in certain circumstances. Comments are no longer deleted in certain circumstances from text files that have outlining turned off. Images are no longer included in project text search queries. Previously, images were searched for text, causing unnecessary long searches for projects with lots of large images. The outliner now handles column sorting better, and reverts to "no sorting" on the third click in a column header. Style shortcut key combinations now start a "1" rather than "0," which works better on laptop keyboards. Multiple windows are now restored correctly in cases where you launch the app after quitting while one of the windows was in full screen mode. Splitting a view while in full screen mode now properly initializes the new view with the correct full screen appearance. Titles in the file inspector now truncate with ellipses if the title is too long for the title text field. The Preferences window automatically resizes to the correct size and is no longer resizable by the user. Previous story MailTags 4.1.8 – Add helpful tags and comments to your emails. Outline 3.5 – View OneNote notebooks. Mellel 3.5.2 – The word processor for scholars, writers, and long document writing.